This week, we’re looking at how you can help an emergency vehicle reach the scene of an urgent situation quickly and safely. Here’s IAM RoadSmart’s head of driving and riding Richard Gladman, to guide you through. Whenever you hear the sound of an emergency siren mute your music so you can work out where the noise is coming from. 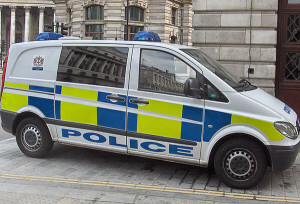 Be prepared to plan your next manoeuvre if the emergency vehicle requires your help to get past. Be sure to pull over and stop where it is safe to do so, giving the emergency vehicle a wide enough berth. Make your intentions clear and certainly avoid blocking any major junctions or stopping in the middle of the road, on the brow of a hill or before a bend. Avoid stopping on kerbs, pavements and verges as they may mask hazards, damage your vehicle or put pedestrians at risk. The vehicle trying to pass may be a plain looking car with emergency warning equipment such as lights fitted to it – be prepared to assist in the same way. Going through a red light or using a bus lane to make way for an emergency vehicle is in fact breaking the law and cameras have no discretion. Avoid this at all costs and be sure to stop only where it is legal and safe to do so. Richard said: “Emergency lights are not always easily visible and the sirens can be heard from different directions so be as vigilant as possible. Motorcycles are also used by all emergency services and they may be hard to see – be prepared to respond and plan your route before acting. IAM calls for drivers to take responsibility. part of their lifelong personal development. casualties. Some 20,830 of these were in London alone. six factors for the cause of each accident they report. cases, it’s the driver or rider themselves who is to blame. Brits prove their generosity over the Christmas period, as almost a third of the British have donated food to vulnerable people in need. Despite the chaos and excitement of the festive period, almost a third (32%) of the British public have remembered vulnerable people in need by generously donating food to those in need across the country, according to a new survey published today. The survey also reveals the generosity across the Britain, as the North West comes out on top as the most generous region (39%), ahead of Wales (38%), South East (37%) and Scotland (37%). The survey goes on to show that more females (38%) have donated than their male counterparts (26%), while the youngest 18-24 age group is the most generous (38%) when it comes to food donations in the lead up to Christmas. Food poverty continues to be a serious issue across the UK despite the economic recovery, as figures published by the Trussell Trust last week showed the number of people helped by food banks in the first half of the 2014-15 financial year is 38% higher than numbers helped during the same period last year. The survey of 2,030 people, by YouGov*, commissioned by Tesco, comes as the latest Neighbourhood Food Collection is launched, where customers are encouraged to donate food to those in need at Tesco stores right across the country. This is the fifth Neighbourhood Food Collection since 2012. Food donations to the Neighbourhood Food Collection benefit a range of people across the country, with donations going to either FareShare, a food redistribution charity, or food banks charity The Trussell Trust. Tesco provides a 30% top up to the charities based on the collective weight of donated goods. To date, the campaign has collected 15.3million meals for people in need since 2012, and the target this year is to provide more than 20million meals. The 15.3 million meals includes the 30% top-up, permanent & local collections, plus surplus food provisions. Neighbourhood Food Collection relies on and is bolstered by volunteers. Tesco is calling for customers to go instore to donate food to designated food collection points. Follow @Tesco for the latest news and use #everycanhelps to find out more about the initiative. Tesco will also be raising money for the FareShare and the Trussell Trust through the sale of special Christmas hats and cards this year. Greg Sage, Community Director at Tesco, commented: “It’s encouraging that people still think food poverty is a serious issue that needs to be tackled, and so many have donated to food banks as a result. This our fifth Neighbourhood Food Collection, and it’s hugely important that we dig deep and do what we can to help people who are in need this Christmas. The night also celebrated the announcement of David Beckham as the face of the brand’s Spring/Summer 2014 campaign. The 3,500 square foot boutique opens on the first floor of the 26,000 square foot historical building, appropriately called Belstaff House. Drawing inspiration from Belstaff’s unique motorcycle inspired legacy, the décor of the New Bond Street interior is greatly influenced by England’s rich architectural and decorative history, including the Georgian, Gothic and Deco periods. With a colour palette consisting of the palest linen grey, slate, black, off-white and silver, the interior entryway will feature original marble columns and antique bronze cage chandeliers. I read that a child laughs 400 times a day on the average, while an adult laughs only 15 times. Which puzzles me – what do you think the children are laughing at? During one particularly dark period of my life I didn’t laugh even 15 times a day. Not nearly. For a variety of reasons, ranging from anxiety in my personal life to overwork and exhaustion, I was depressed. I may not yet have recognized it as depression (later I did), but now I can see that the signs were there. My self-loathing surfaced once when I found myself driving alone on a cold Spring afternoon to spend a couple of days with colleagues on a work-related planning session. “I don’t have time for this!” I said out loud, and berated myself for not saying no. I was leaving my spouse to contend with children by herself while my daily work piled up in my absence. I felt submerged by an ocean of problems, professional and personal, with no chance of finding any way out. Everything looked bleak. I met my colleagues for supper the first evening. To my surprise, we sat around the dinner table telling funny stories. We related real-life incidents that had happened to each of us. I had to admit, even in my despondency, that it was good to laugh. And those turned out to be some of the funniest stories I had ever heard! My anxiety melted as I relaxed and I found myself laughing hard – harder than I’d laughed for years. The next day we worked, but we also played. We invented games using whatever recreational equipment we could lay our hands on. The sheer fun of playing, something else I hadn’t done for far too long, awakened something within me I thought I might never feel again. The following day I returned home and I felt better than I had in months. Though it eventually took a lifestyle change to lift the depression for good, laughter became a key ingredient of that change. I determined then and there that a therapy of laughter would become a permanent part of my life. I’ve held to it, and have found that regular and hearty laughter is essential if I want to maintain inner peace and good health. I had discovered a great truth about laughter – it is good for the body, the mind and the spirit. It’s a natural stress reliever. Have you ever laughed so hard that you doubled over, fell off your chair, spit out your food or wet your pants? (Yes, I’m not proud to say, I have.) You just cannot maintain muscle tension when you are laughing. Author Norman Cousins used to say that laughter is so beneficial for your body that it is like “inner jogging.” Numerous studies have shown that laughter is good for your heart, it boosts your immune system and promotes overall good health. The good news is that you are not limited to 15 laughs a day. You’re allowed hundreds of laughs. What might happen if you doubled the usual adult rate and tried to laugh 30 times today? Can you do it? You’ll probably notice an immediate difference in how you feel. Then try to laugh 50 times a day. By this time you will begin to notice an improvement in your relationships. But don’t stop there. What if you could find 100 reasons to laugh every day? You can do it by surrounding yourself with people you feel good around, looking for humor in daily life, taking a minute to remember what’s funny and even keeping a journal of whatever makes you happy. Find 100 reasons to laugh. You are bound to feel better, you will cope with problems more effectively and people will enjoy being around you. Besides unhappiness, what do you have to lose? Did you know that Albert Einstein could not speak until he was four years old and did not read until he was seven? His parents and teachers worried about his mental ability. Or that Beethoven’s music teacher said about him, “As a composer he is hopeless”? What if young Ludwig believed it? When Thomas Edison was a young boy, his teachers said he was so stupid he could never learn anything. He once said, “I remember I used to never be able to get along at school. I was always at the foot of my class…my father thought I was stupid, and I almost decided that I was a dunce.” What if young Thomas believed what they said about him? When F. W. Woolworth was 21, he got a job in a store, but was not allowed to wait on customers because, according to his boss, he “didn’t have enough sense.” I wonder if the boss was around when Woolworth became one of the most successful retailers of his day. When the sculptor Auguste Rodin was young he had difficulty learning to read and write. Today, we may say he had a learning disability, but his father said of him, “I have an idiot for a son.” His uncle agreed. “He’s uneducable,” he said. What if the boy had doubted his ability to excel? A newspaper editor once fired Walt Disney because he was thought to have no “good ideas.” The great Italian tenor Enrico Caruso was told by one music teacher, “You can’t sing. You have no voice at all.” And an editor told Louisa May Alcott, just a few years before she wrote the classic novel Little Women, that she was incapable of writing anything that would have popular appeal. History will long praise each of these famous people, but what became of their critics? Nobody even remembers some of their names, which is all that need be said. But what if these young people had listened to those critical voices and became discouraged? Where would our world be without the music of Beethoven and Caruso, the art of Rodin, the ideas of Albert Einstein and Thomas Edison, the imagination of Walt Disney or the literary contributions of Louisa May Alcott? As it was so accurately put, “It’s not what you are, it’s what you don’t become that hurts.” (That from Oscar Levant.) What if these people had not become what they were capable becoming, had not done what they actually could have accomplished, just because they were discouraged by people who couldn’t see them for what they were? We all have potential and, whether you realize it or not, your desire to do or be more than you are is your best indicator of future success. Others may discourage you, but the most important voice to listen to is your own. Do you believe in you? Still the voices of your critics. Listen intently to your own voice, to the person who knows you best. Then answer these questions: Do you think you should move ahead? How will you feel if you quit pursuing this thing you want to do? And what does your best self advise? What you hear may change your life. 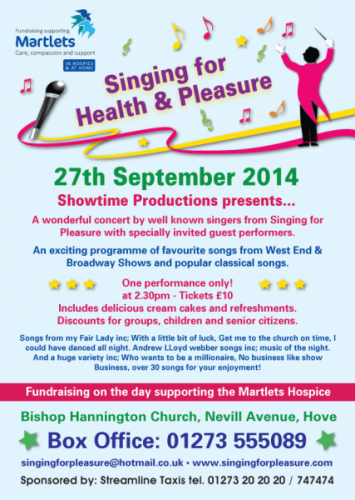 A wonderful concert by well known singers from Singing for Pleasure with specially invited guest performers. 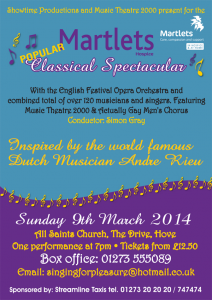 An exciting programme of favourite songs from West End & Broadway Shows and popular classical songs. Includes delicious cream cakes and refreshments. Discounts for groups, children and senior citizens. Songs from my Fair Lady inc; With a little bit of luck, Get me to the church on time, I could have danced all night. Andrew LLoyd Webber songs inc; music of the night. And a huge variety inc; Who wants to be a millionaire, No business like show Business, over 30 songs for your enjoyment! 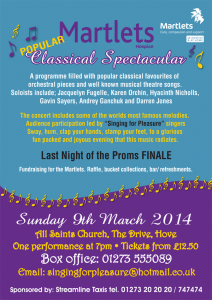 We are proud to announce a Classical Spectacular which will take place on Sunday 9th March at All Saints Church in Hove in support of the Martlets Hospice. Inspired by the world famous Dutch musician Andre Rieu, this concert features some of the most popular classical orchestral and vocal pieces with music by Johann Strauss, Elgar, Bizet, Puccini, Sullivan, Lehar and Verdi. The audience is invited to sway, hum, sing-a-long, clap their hands, stamp their feet in the glorious, fun-packed, joyous atmosphere that this music radiates. 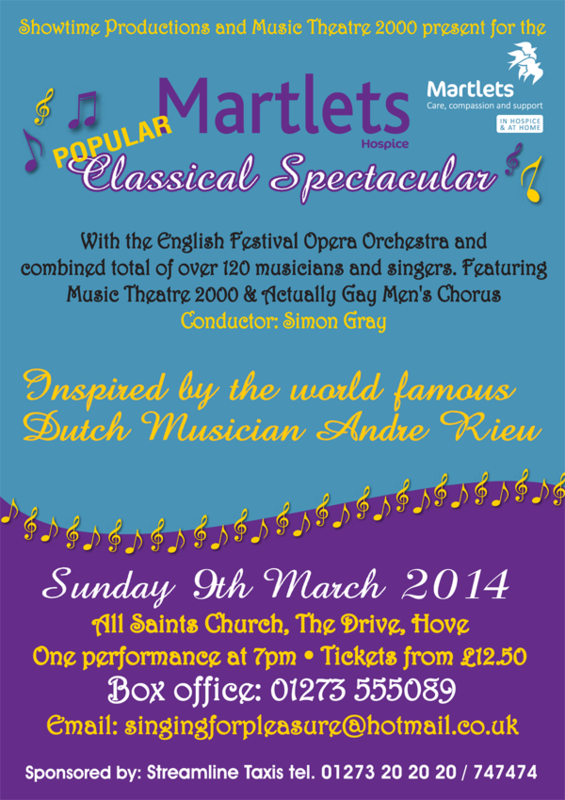 The programme includes Strauss’ The Blue Danube Waltz, the Trisch-Trasch Polka, the Radetzky March, Elgar’s Chanson du Matin, the Intermezzo from Cavalleria Rusticana, arias and choruses from Carmen, Tosca, The Merry Widow, Die Fledermaus, the celebrated duet from Bizet’s The Pearl Fishers, the Humming Chorus from Madama Butterfly and many more, finishing with a “Last Night of the Proms” finale. The wonderful line up of soloists includes soprano Jacquelyn Fugelle who has sung as a soloist at the Royal Opera and with all the major British opera companies as well as extensively across Europe. 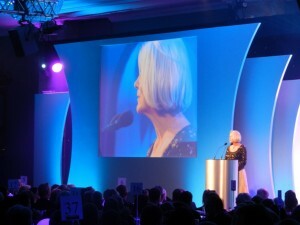 She is a regular soloist on Friday Night is Music Night on BBC Radio Two. Hyacinth Nicholls (mezzo soprano) is from Trinidad but is based in London. She has performed as a soloist with Glyndebourne Festival Opera, The Royal Opera and English National Opera. Gavin Sayers (tenor) has sung with Glyndebourne and Scottish Opera; Darren Jones (baritone) has sung with Glyndebourne Festival Opera, Opera North and with the Cologne City Opera. Soprano Karen Orchin has sung with Regency Opera and English Festival Opera and is regular performer with MT2000. Also taking part is special guest singer Andrey Ganchuk from the Ukraine. The chorus of some 50 plus singers is made up from the combined choruses of MT2000 and Actually Gay Men’s Chorus and the large orchestra consists of players from the English Festival Opera conducted by Brighton based musician Simon Gray. Since 1.4.13, when the Health and Social Care Act 2012 took effect, the responsibility for the NHS passed from central to local government. The present crisis in A&E is therefore the responsibility of every elected councillor of every Local Authority. They should act through the new committees created for that purpose, namely their Health and Wellbeing Boards. The chairmen of the new Clinical Commissioning Boards (CCGs) sit on this committee ex officio, and they have the power to do this, as they control about 2/3 of the NHS budget (£65 bn pa nationally, and £400 mpa locally in the city of Brighton and Hove) Councillors can solve the crisis in A&E by telling their CCGs to do what Prince Charles told the World Health Organisation conference 8 years ago (in May 2005) and integrate into the NHS the best of complementary therapy. Polls show 3 out of 4 patients want complementary therapy (such as yoga classes) free on the NHS, and 1 out of 2 GPs suggest they try it. However, the patient has to pay, which most cannot afford. This is the cause of health inequalities. The rich get complementary therapy, and learn how to live healthily, but the poor cannot afford it, so on average suffer long term conditions 18 years before the rich, and die 9 years earlier, as found by the Marmot report in 2010. Aneurin Bevan’s promise that the state would look after everyone from the cradle to the grave by giving away free treatment (mainly drugs) has not worked, as public health has declined, as 1 in 4 of us (15 million) now have at least one long term condition. Last year, GPs wrote a billion monthly prescriptions, which implies that half the population are on 3 drugs continuously, the second to counteract the side effects of the first, and the third to counteract the side effects of the second. Unless in emergency patients have to wait a fortnight for an appointment to see their GP, and patients now have to wait 12 hour at A&E. Solution. Allow GPs to prescribe courses which give patients self help tools to prevent, heal and cure their conditions. The solution lies in the word ‘doctor’, which comes from the latin verb ‘doctare’, meaning ‘to teach.’ Doctors’ original function in society was to teach people how to live healthily, but this was hijacked by the drug companies, for whom they have become pill pushers. GPs should revert to their original function as teachers, by prescribing NICE-recommended courses which teach self help techniques to prevent, heal and cure dis-eases and long term conditions. The Mindfulness Based Cognitive Therapy (MBCT) 8 week course is NICE-recommended for depression (CG232004, and CG123 May 2011) This is clinically indicated for one in three patients presenting with anxiety. Transport for London provide it for their sick staff, and have thereby reduced their staff absence rate by 73%. It is provided free on the NHS, but unless you are suicidal, the waiting time is excessive, so GPs cannot readily prescribe it. Under the NHS constitution, patients have the statutory right to NICE-recommended treatments (including the MBCT course) if their doctor says it is clinically appropriate. Theoretically, the MBCT course is clinically appropriate for the 160,000 patients in Sussex who are depressed. However, the old Primary Care Trust (PCT) only commissioned about 8,000 patient places pa of MBCT courses, which means that the waiting time for a course for depressed patients s 160,000/8,000= 20 years. To enable GPs to prescribe a MBCT course as easily as Prozac, and for the patient to obtain a course within a few weeks, the CCG should create a voucher system by which the patient could cash the prescription with and private provider of the MBCT course. There are many of these in every town, and they are providing them like evening classes for between £150 and £370 per client. I have created a company called Social Enterprise Complementary Therapy Company (SECTCo) to provide this voucher scheme in Brighton and Hove. For further details, see www.sectco.org.uk, and www.rteginaldkapop.org sections 9.56,9.57, and 9.59, or contact John Kapp, 22, Saxon Rd Hove BN3 4LE, 01273 417997, [email protected], after 10.6.13. 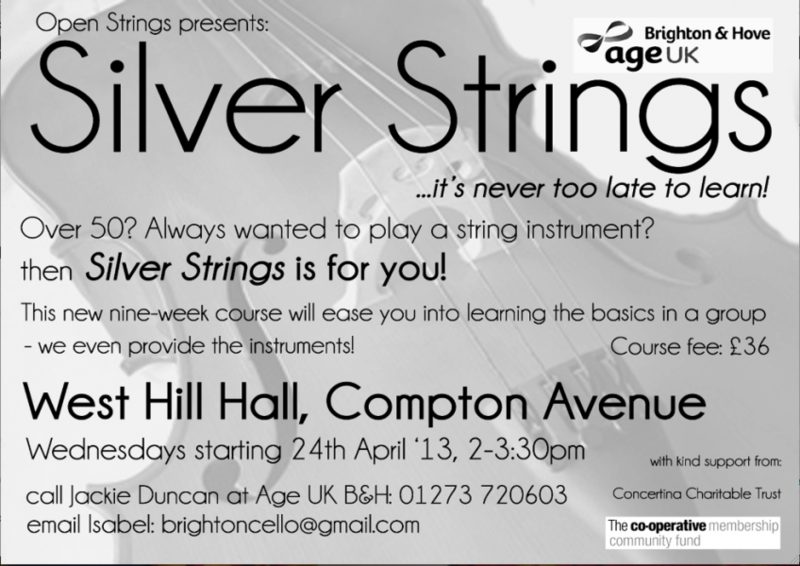 Learn to play a string instrument! Over 50? Always wanted to play a string instrument? Then Silver Strings is for you. -we even provide the instruments! Cuba’s fight for independence during the 1890s is well documented, but now a new film tells the story from the perspective of one of Cuba’s most influential families – the Bacardí family – who played a significant role in the revolution. 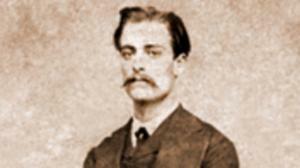 Emilio Bacardí, the eldest son of Bacardí rum founder Don Facundo Bacardí Massó, was a fearless advocate of freedom in Cuba. On numerous occasions, he narrowly escaped the sharp end of Spanish rule. With Emilio’s political stance and Bacardi family prominence during this complex and critical war, the stakes were always high. On one occasion Emilio’s life was saved, due to the quick thinking of his dependable maid. She ensured that secret letters thought to contain evidence of Emilio’s involvement with the Cuban rebel army were kept from the Spanish Governors, thus enabling Emilio to continue his campaign. This exclusive behind the scenes video is one of three movies, providing a window into some of the true stories of the Bacardí family’s rich past in Cuba. Click here to view the series of films www.youtube.com/bacardi. Please note this film is a fictional romanced re-interpretation of an episode of the life of Emilio Bacardí who participated to the struggle for Cuba’s independence in the late 1800’s and was imprisoned and exiled for that. The Elton John AIDS Foundation (EJAF) is one of the foremost independent AIDS charities in the world. The mission is to provide focused and sustainable funding to frontline programmes that help to alleviate the physical, emotional and financial hardship of those living with, affected by or at risk of HIV/AIDS, and to continue the fight against this worldwide pandemic. 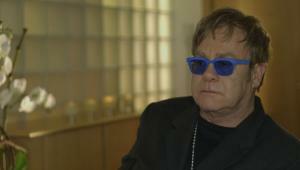 Following the loss of many close friends to AIDS in the early 90s, including Freddie Mercury and American teenager Ryan White, and seeing the lack of understanding and stigma attached to the disease at that time, Sir Elton John established EJAF in the US in 1992, and subsequently EJAF in the UK the following year (1993). While functioning as separate organisations, both EJAF UK and EJAF US pursue the common goals of empowering people infected, affected and at risk of HIV/AIDS;alleviating their physical, emotional and financial hardship; and improving their quality of life, enabling them to live with dignity and exercise self determination. 100% of the funds raised from the event including ticket sales are donated directly to the Elton John AIDS Foundation (charity registration no. 1017336). To date, the GREY GOOSE Winter Ball has raised more than £2.3M for the foundation and is becoming one of the charity’s biggest fundraisers. Singing for Pleasure has 4 venues in the Brighton area. Forget all your Troubles and Sing! Sing! Sing! Open to all aged 15 or over. 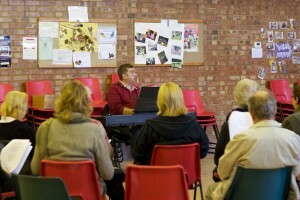 Tuesday afternoons at St Phillip’s Church Hall. Wednesday afternoons at Southwick Methodist Church Hall. 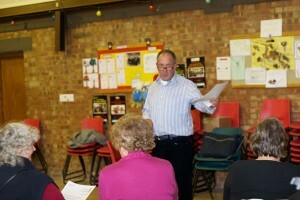 Wednesday evenings at St Leonard’s Church Hall. NEW! Classical section will follow the main singing session. NEW! Thursday afternoons at Patcham Methodist Church Hall. Course of 10 classes for only £5 each. Regular single session fee £7.00. Singing for Pleasure is divided into 10 week terms with the addition of some odd weeks. Fees are payable for the 10 week term at the founders’ price of £50.00. Weekly only fees are £7.00 per weekly session. It is not possible for roll-overs or refunds of any term fees paid for. Payment can be made by cheque payable to Showtime Productions and sent to 122 Nevill Road Hove BN3 7BT or paid for on the singing night. Please note it is very difficult to precisely time each session because the halls are very popular and are usually booked back to back but they should be for approx 1 hour duration. With so many people joining times may vary slightly – please be understanding. What you can look forward to subject to confirmation. Social to invite your friends at the end of each term. 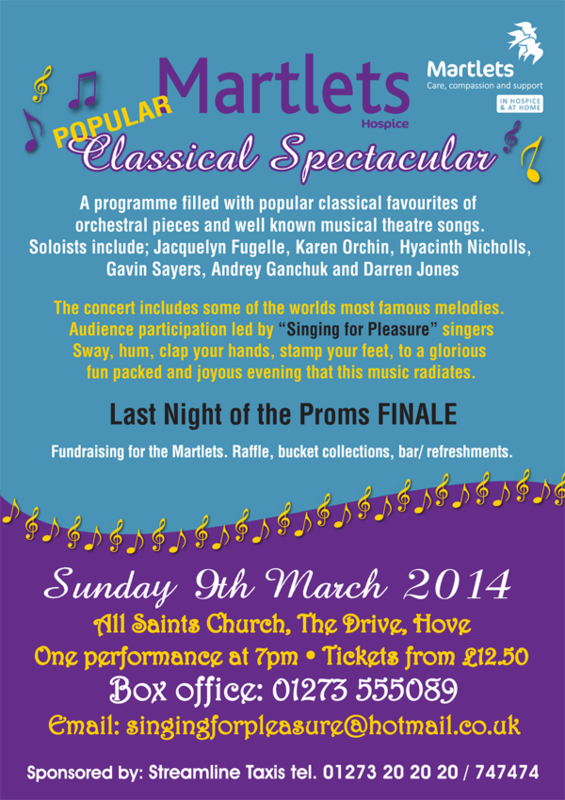 Appear on stage twice a year at Hove Centre for the Martlets Musical Spectaculars in front of up to 900 people. Everyone of all ages and singing abilities are welcome to join Singing for Pleasure. What exactly is “Singing for Pleasure”? It’s just that, “Singing for Pleasure” everyone comes a long and has fun, once Simon gets playing there’s not a long face in the room. No one is listening or looking at anyone else, so there’s no need to be shy, just let rip and sing to your hearts content. Fantastic Health benefits as well! 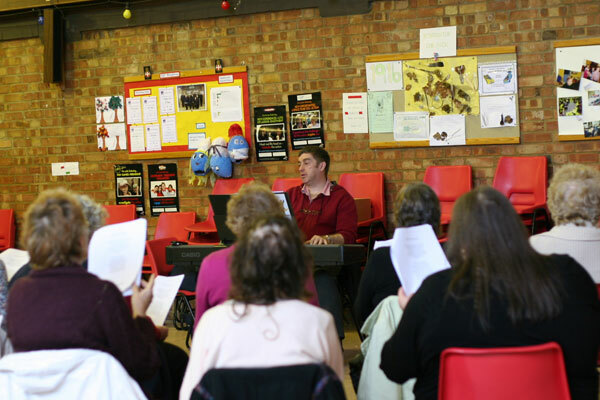 Apart from making everyone feel great, there are even more health benefits with Singing for Pleasure. Your in great hands with Simon! Simon Gray, conductor and musical director of Singing for Pleasure, studied at the Guildhall School of Music & Drama and enjoys a varied musical career encompassing a wide range of musical styles from pantomime and children’s shows to opera and the concert platform. He was principal conductor for both Regency Opera and English Festival Opera and has made guest appearances with European Chamber Opera, and English Country Garden Opera as well as many smaller companies. He has conducted concerts at the Royal Festival Hall, The Royal Albert Hall, Queen Elizabeth Hall and St John’s Smith Square as well as many other venues around the UK. He has conducted opera and major touring musicals, as well as West End shows and has musically directed pantomimes with a host of stars. In 2007 year he had the honour to conduct the 200th anniversary celebration of The Theatre Royal, Brighton. In 2008 & 2009 Simon was invited to Norway where he took up a position as Choir Master on board the MS Midnatsol as she cruised the Norwegian coastline. Performing beneath the Northern Lights is a wonderful experience! 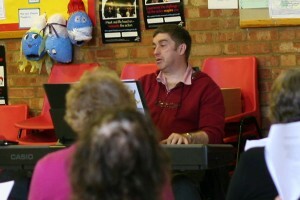 You can find out more about Simon at his website www.musictheatre2000.com. Robert and Corinne have been involved in show groups for over 30 years having produced big Musical shows in Brighton over the last 10 years raising over £150 000 for local charities. They both organise all the Singing for Pleasure events, joining in with the singing as well as assisting all the members of the four groups. Where to find Singing for Pleasure. SUNDAY 14th OCTOBER 2012 – ROSWELL, NEW MEXICO: After flying to an altitude of 39,044 meters (128,097 feet) in a helium-filled balloon, Felix Baumgartner completed a record breaking jump for the ages from the edge of space, exactly 65 years after Chuck Yeager first broke the sound barrier flying in an experimental rocket-powered airplane. The 43-year-old Austrian skydiving expert also broke two other world records (highest freefall, highest manned balloon flight), leaving the longest freefall record to project mentor Col. Joe Kittinger. Baumgartner landed safely in the desert of New Mexico after jumping out of his space capsule at 39,044 meters and plunging back towards earth, hitting a maximum of speed of 1,137 km/h through the near vacuum of the stratosphere before being slowed by the atmosphere later during his 4:19-minute long freefall. 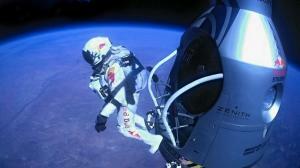 Baumgartner’s jump lasted a total of 9:03 minutes. Countless millions of people around the world watched his ascent and jump live on television broadcasts and live stream on the internet. At one point during his freefall Baumgartner appeared to spin rapidly, but he quickly re-gained control and moments later opened his parachute as members of the ground crew cheered and viewers around the world heaved a sigh of relief. Baumgartner had endured several weather-related delays before finally lifting off under bright blue skies and calm winds on Sunday morning. The Red Bull Stratos crew, watching from Mission Control, broke out into spontaneous applause when the balloon lifted off. GREY GOOSE vodka unveils its bespoke collection of cocktails designed especially for the GREY GOOSE Winter Ball to benefit the Elton John AIDS Foundation, in collaboration with this year’s character partners Emeli Sandé, Labrinth, Gareth Pugh, Ellen von Unwerth and Karim Rashid. The internationally acclaimed and star studded event, now in its sixth year, will be taking place at Battersea Power Station on Saturday 10 November, with a theme of 1950’s Cote D’Azur. Guests will be transported from a chilly autumn evening in London to a scene reminiscent of the Riviera in its heyday, where poolside glamour, palm trees and pastel colour schemes abound. The GREY GOOSE Winter Ball to benefit the Elton John AIDS Foundation will begin with a glittering reception, where guests will be invited to sip bespoke cocktails created by each of the evening’s incredible partners. GREY GOOSE ambassador Joe McCanta has worked with each of them to construct a cocktail that either perfectly encapsulates their individual character and style, or that pays homage to the evening’s theme. As well as designing their own bespoke cocktails for the evening, Ellen Von Unwerth, Gareth Pugh and Karim Rashid will also be donating a portable cocktail bar for auction that they have designed especially. Labrinth and Emeli Sandé will treat guests to a dazzling musical performance following a spectacular Mediterranean dinner, courtesy of The Connaught’s two Michelinstarred Head Chef Hélène Darroze. Using pioneering techniques in mixology, some of the cocktails will invoke guests’ senses to immerse them completely in their surroundings. Labrinth’s Une Journée A La Plage is a sensory drink that combines GREY GOOSE and banana liqueur with notes of coconut, pineapple and lime, topped with a parasol infused with the scent of summer. The evening’s guests will also be able to sip Emeli Sandé’s Poolside Martini. Elegant, calm and sophisticated, this azure blue cocktail captures the essence of a 1950’s poolside scene with a stylish combination of GREY GOOSE Le Citron, vanilla and thyme, accessorised with a white beach towel. 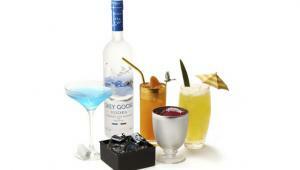 Gareth Pugh’s Grey Goose La Boite Poire is served in an iconic black box that is inspired by the designer’s collections. Sweet and salty, this drink features GREY GOOSE La Poire, French tarragon syrup and fresh lime, served over ice with a coriander-black-salt rim. Ellen Von Unwerth‘s cocktail, the GREY GOOSE Golden Angel, is a rich, glamorous drink inspired by 1920’s French Cabaret and the burnished gold and orange shades of the photographer’s cocktail bar. GREY GOOSE L’Orange and traditional French flavours are given a distinctive twist with a rare liqueur made from Pyrenean herbs and a decadent sprinkling of gold leaf. Designer Karim Rashid’s cocktail, Grey Goose L’Avenir, is inspired by his minimalist bar design and his signature futuristic aesthetic. Intended as ‘the martini of the future’, this is a seductively tart and slightly bitter mix of GREY GOOSE and a host of super foods including pomegranate, milk thistle and quinine wine, housed in a metallic goblet and garnished with a glistening ice orb. 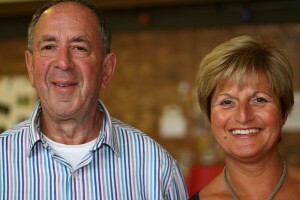 Tickets are available to purchase by contacting the charity on 020 7603 9996 or online at ejaf.com. 100% of the ticket price is donated directly to the Elton John AIDS Foundation (charity registration no 1017336). An elegant and refreshing combination of GREY GOOSE vodka, fresh lime juice and elderflower, served in a flute topped with chilled soda. Tuesday 9th October 2012 – Roswell, New Mexico – Felix Baumgartner’s attempt to jump from the edge of space had to be aborted at the last minute (11.42hrs MDT local time) due to wind gusts that made it impossible to safely inflate the 30 million cubic feet / 834,497 cubic meters balloon. 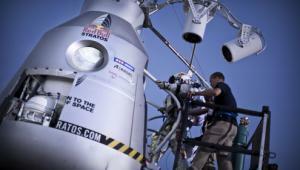 Baumgartner and the Red Bull Stratos team had waited for five hours in vain for the winds to calm down for the launch. The Austrian athlete is attempting to undertake a stratospheric balloon flight to an altitude of 120,000 feet / 36,576 meters to become the first person to break the speed of sound in freefall. The findings from the mission will also help to improve our scientific understanding of the stratosphere and how the body copes with the extreme conditions at the edge of space. At this stage the mission team is closely monitoring possible new launch days before approval is given for another countdown. Progress will be communicated as it happens. Today, October 8th, 2012, ROSWELL, New Mexico (USA) – As the mission grows closer Felix’s family and friends are also making their final preparations for his 120,000 feet record breaking jump, supporting him along the way alongside the mission team. 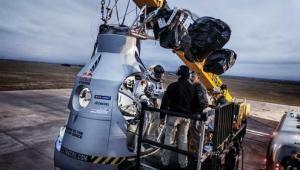 The mission team have conducted a step by step dress rehearsal of the final hours before the Red Bull Stratos launch. A successful result, with the addition of a favourable weather report, has heightened the team’s anticipation for a lift off on Tuesday, October 9. The entire crew assembled to practice the 58 steps that will take the mission from a preparatory weather briefing all the way through to a dawn launch of the 55-story high balloon. The rehearsal is a vital component of preparation for every jump as it enables the teams from all four areas of responsibility to consolidate their checklists into one seamless process. Understanding the need to coordinate his activities with those of other crew members, Baumgartner participated too, undergoing a medical check, getting suited up and entering the capsule using the same activation plan that will be implemented at the final launch. “You cannot do this without a team to support you,” the Austrian noted. Equally reassuring was the news from meteorologist Don Day, who had studied forecast data throughout the night in Mission Control. After a 24-hour postponement due to an unfavourable weather forecast, Tuesday October 9 continues to look promising for the launch. In the days leading up, the team will make minor adjustments to the rundown, even refining the language in which checklists are written to ensure that all crews are absolutely synchronized. Baumgartner will launch with the largest manned balloon in history: 550 feet/ 168 meters high at the start with a volume of 30 million cubic feet/ 850.000 cubic meters. “The good news is that we usually have a day or two after this type of cold front moves through where the weather can be favorable for a balloon launch“, Don Day says. Red Bull Stratos, created by Red Bull and Felix Baumgartner, is a mission to the edge of space that will try to surpass human limits that have existed for more than 50 years. Supported by a team of experts, Felix Baumgartner will undertake a stratospheric balloon flight to more than 120,000 feet / 36,576 meters and make a record-breaking freefall jump in the attempt to become the first man to break the speed of sound in freefall (an estimated 690 miles / 1,110 kilometres per hour), while delivering valuable data for medical and scientific advancement. The European Commission and four-time European Champions FC Barcelona today announce an unprecedented partnership aimed at improving the health of millions of people across Europe. ‘Quit Smoking with Barça’ will harness the success of the European Commission’s “Ex-Smokers are Unstoppable” campaign and the support of Barça’s worldwide fan-base to help 28 million European smokers* kick the habit forever. The unique partnership will see one of the world’s most prestigious sports clubs partner with a pan- European institution to support a public health campaign on a never before seen scale. ‘Quit Smoking with Barça’ is the latest initiative of the award-winning “Ex-Smokers are Unstoppable” campaign and the partnership with FC Barcelona marks the first time the European Commission has collaborated with a sporting partner that reaches the hearts of millions of people to make a real difference to the health of Europe. The programme aims not to judge smokers, but instead underlines the many benefits of quitting smoking, combining these positive messages with the proven tools of the “Ex-Smokers are Unstoppable” campaign. ‘Quit Smoking with Barça’ offers supporters of Barça, football and sport in general, a personalised health training programme with daily quit smoking tips and encouragement direct from key figures at the Catalan club. 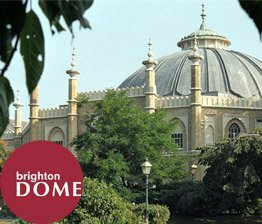 The Dome in Brighton is known for many things. Which one stands out the most? Perhaps it’s ABBA winning the 1974 Eurovision song contest and then going on to become one of the world’s greatest ever bands. It was also where Pink Floyd first performed Dark Side of the Moon and Jimi Hendrix, Nina Simone, The Smiths and Led Zeppelin, have all played there. 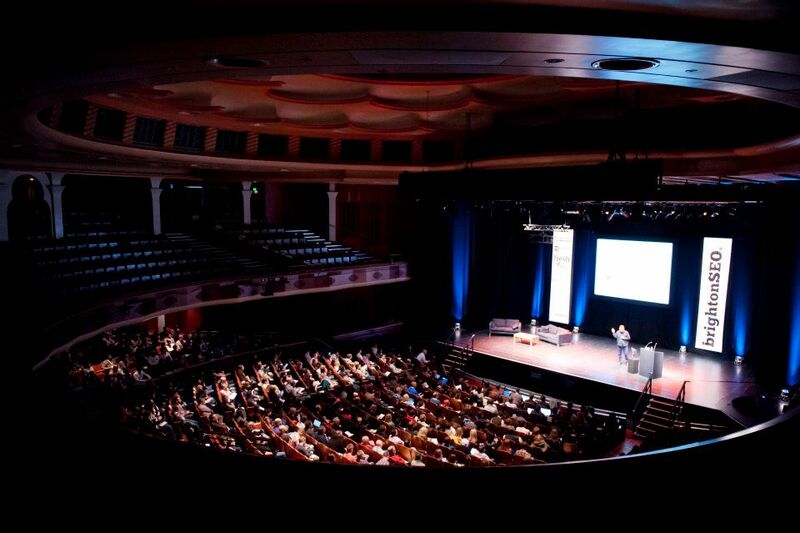 There’s no limit to the events that can be staged at Brighton Dome from a large conference, an intimate meeting, impressive exhibition, exclusive banquet, gala dinner, awards ceremony, formal seminar or corporate party. All five venues within the complex can be used individually or combined and there are also three additional external break-out facilities, all situated within 100 metres. Corporate clients include Microsoft, American Express, L’Oreal, BBC and Barclays and organisations return time and again because of the flexibility of the spaces and the expertise of in-house production services team. AVT Connect feels honoured to be a preferred supplier at the Dome and is no stranger to producing events in each of their five venues and in the numerous breakout rooms and spaces that are also available. From mid June to the end of July, AVT produced six events for a variety of different and interesting organisations which couldn’t be more different to the rock star heritage spoken about above. As a preferred supplier, AVT has a wealth of experience integrating successfully with the in-house facilities and technical team. 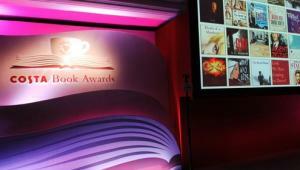 All of these events required flown screens, great connectivity, presentation slides, layers of lighting and sound. They required AV Technicians on hand to stage manage and co-ordinate all the different elements to ensure a flawless delivery and each of the events had their own unique story to tell. BASHH is the lead representative body for those practicing sexual health including management of STIs and HIV in the UK. Whilst the nature of some of the subject matter could be considered to be somewhat sensitive, this was the first time that AVT had used Wi-Fi to send all presentations from speaker preview to technical operations, instead of the usual hard wired network. This saved the client money and was a seamless delivery of audio visual slides. The ASSC is an academic society that promotes rigorous research directed toward understanding the nature, function, and underlying mechanisms of consciousness. Their 16th annual meeting took place in the Brighton Dome Concert Hall and Pavilion Theatre and the Corn Exchange was also used for presentations and display. There was talk of having real live tissue from Einstein’s brain on display for people to view, which didn’t happen at the last moment, much to the disappointment of several people! It gave AVT immense pride to produce the University of Brighton and University of Sussex graduations. Spread over four days, the University of Sussex graduations hosted a total of 2,225 students – the biggest number ever to attend the summer ceremonies. They were awarded their degrees by the University of Sussex Chancellor, Sanjeev Bhaskar, at Brighton Dome, watched by 6,000 guests, family and friends. Hundreds more were watching around the world as the ceremonies were broadcast live online, for which AVT provided the feed. The record number of 5,000 University of Brighton graduating students at this year’s summer award ceremonies shared the stage with nine honorary graduates including Jonny Ball (Doctor of Science), the man who taught millions to ‘think of a number’, and Harvey Goldsmith CBE (Doctor of Arts), the legendary rock impresario. I just signed up for this great event which is taking place on Sunday 30th from Plumpton Racecourse. Its a cycling sportive for Macmillan Cancer Care. It should be a great fun ride for women of all abilities, so why not sign up too and join the hundreds taking part in a fun day out on the quiet Sussex country lanes and raise money for a great cause (or any cause of your own!). [contentbox headline=”Brighton and Hove Seafront” type=”info”]Brighton and Hove beaches stretch for about 7 miles, from Hove Lagoon in the West to Rottingdean in the East. The seafront has bars, restaurants, nightclubs and amusement arcades, principally between the piers. Being less than an hour from London by train has made the city a popular destination, especially with big party groups. Brighton beach has a nudist area (by Kemptown near the easterly edge of the promenade). Brighton’s beach, which is a shingle beach up to the mean low tide mark, has been awarded a blue flag. The Monarch’s Way long-distance footpath heads west along the seafront above the beach. to us, with no strings attached? square he finds 800 young men named Paco waiting for their fathers. therefore, is not considered valid since he will not give it freely. can be snatched back at any time. Mom broke the tension by giving her a small gift- wrapped box. ‘Read the card,’ Mom instructed. hugged her mom as the card fell to the floor. the baggage handler smiled and remained calm. life unfazed by the turbulence that affects most people. through life with a serenity I can only envy. can truly find calmness in the midst of chaos. help us change the future. change those things they can. Resilient Leaders Learn from Everyone-including DOLPHINS! * Know everyone’s name and something unique about each one. * Set everyone up for success. * Provide more stimulation for top performers. * Allow for fun and individuality. highlight each person so they feel singularly recognized. is strange and so there’s a modicum of comfort. stimulation and challenge, Tanner “checks out” of his work. have “checked out”. Increased stimulation might be just the answer. where she hides her accessories! Wood is good when it comes to interior design. It’s a look that most of us love and you can’t really go too far wrong with – whatever you choose. An increasing number of interior designers are going for the all-wood look to create a ski cabin type of feel. But wood is a lot more versatile than many of us think. Of course, it’s just about the most traditional interior design material there is. But it can also look stunningly modern if it’s carefully engineered. And there are an increasing number of companies doing just that all around the world – and doing so from sustainable sources. Solid oak which has been stored and kiln-dried and is from reputable suppliers and furniture manufactures can look as contemporary as any other material when it’s carefully engineered with clean lines to a contemporary style. And there are many ranges that achieve exactly that kind of look. If you have a look, for example, at some of the oak desks from Furnishing Homes, you’ll soon see just how modern a material oak can be. It’s the mix of the traditional material with the most contemporary design that gives some of the more modern ranges that unique feel. It’s also easy to coordinate the look throughout your entire home – no matter how big or small it is. From dining suites to coffee tables, office furniture to bedroom furniture, occasional items and kitchen furnishings – a similar theme throughout your entire home really brings a wonderful feeling of design continuity achieving whatever overall look you’re trying to. It’s the theme that has overriding importance here. If it’s a theme that complements your home setting – so much the better. But if you love all things modern and contemporary and have mentally written off an all-wooden theme or a motif which includes a lot of wooden furniture, then this may be an oversight; wood is good! When you’re setting up a guest bedroom it can be really great to make it a perfect room so that your guests feel pampered and spoiled when staying at your home. And as well as making it nice for other people, revamping a guest bedroom is a nice project as you can usually take the time over the redecorating and furnishing because you won’t need to displace anyone while you do it. As the guest bedroom is used by a range of different visitors, you should try and pick a theme for the room that suits all tastes – as well as your own. Examples of things to avoid would be decorating the whole room in flowery pinks or with very bold colour choices. Choosing a neutral base for the walls and adding some touches of colour with the curtains and bed linen is a much safer approach – so the guest room is as suitable for your mother in law as it is for a work colleague to stay in. You can buy furniture from one of the many bedroom furniture collections that retailers now offer. Start off by deciding what kind of style furniture you like. Do you prefer metal bed frames or wooden ones? There’s such a range to choose from that you need to narrow your choices before you start looking. For example, it’s really easy to buy cheap oak beds online, but they don’t all look the same. Some are painted cream or white, with wooden ends, others are waxed and some are stained to a dark rich colour. A nice touch for a guest room is to have a dressing table. Some bedrooms don’t have room for dressing tables, but in a guest room, wardrobe space is not quite as essential as in your own bedroom, so you could make space for a dressing table and provide a smaller wardrobe instead. A dressing table can be a really nice feature in a room, especially if you choose one that has intricate carving on it, or an interesting mirror on the top. It also adds a touch of luxury to a room, making sure that your guests will have that pampered feeling while they’re staying in your home. Finishing touches in a guest room are really comfortable bedding and pillows, and a set of towels which coordinate well with the bedroom. The only trouble with making a guest room too nice is that you might find your guests never want to leave! Do you have any tips for the other readers on how to create the perfect guest room? The ideal living room should really live up to its name and be a living room. After all, this is the only room in most of our houses where the room’s designated purpose is leisure and relaxation. All the other room we use have a purpose which is largely functional. The most functional of all the rooms in the modern house is, of course, the kitchen where we prepare food, wash and clean up after ourselves and usually do a whole lot more like eat, store food and drink, and maybe even entertain occasional guests etc. Obviously, our bedrooms are highly important as we spend more time here than anywhere else in the house – though most of the time we’re unconscious of course. Other rooms are generally used for storage and, of course, we eat in our dining rooms. So for most of us in this day and age – we’re left with the appropriately-named living room or lounge to , well…, live and lounge around! The problem comes when the room isn’t much of a living space but, instead, is rigidly formal and a little boring. Often, the living room furniture people choose is designed to make a room look smart rather than to have fun and relax in. But we can still achieve both these goals with the right furniture choices which are also good fun. Take the recliner chair, for instance, which is great fun to sit and relax on, but also looks neat and tidy immediately in its non-reclined position. There are many other choices that achieve the same purpose like a smart pouf that fits into the corner of a corner sofa looking perfect when not in use – but affording the whole family the chance to lie down together in front of a good film on a cold winter’s night. The ideal living room is really about living! To celebrate the 30th anniversary of the classic children’s book, Dear Zoo by Rod Campbell, a range of gorgeous babywear products will be available in TU at Sainsbury’s this autumn. The cosy cream coloured neutral babywear features characters from the classic Lift the Flap children’s book and will be in stores from 16th September. The range, which is completely new for 2012, includes a Sleepsuit and Matching hat set with mini ears detail, £8.50 [aged newborn to 12 months]. There is also a pack of two short sleeved Bodysuits [aged newborn to 12 months] featuring the puppy character from the story, £8.00. There is a gorgeous 3-piece gift set which includes a pair of booties featuring the monkey character, as well as mitts and cute little hat. All three items come in a cream gift bag [aged newborn to 6 months] £8.00. To compliment any baby’s nursery, there is a stylish and neutral coloured cream sleeping bag featuring the monkey from the Dear Zoo book as well as a gorgeous repeat-pattern of all the characters from the story. The Sleeping Bag is 2.5 Tog which is perfect for Autumn/Winter nights and is £15.00 [aged newborn to 12 months]. To complete the range there is a pack of two bibs featuring the puppy and other Dear Zoo characters, £5.00. All products are available from TU at Sainsbury’s from 16th September 2012. Whatever the GCSE results – good or bad – for the first time thousands of 16 year-olds across the country will be making choices that will influence the rest of their lives. All this is happening at a time when jobs are harder than ever to come by, working lives are likely to be longer, university fees are increasing and one-to-one careers advice is no longer freely available. Whether youngsters chose to stay at school, go to college, get an apprenticeship or find work, their success will depend largely on their attitude. Celia Middleton, founder of Careers4u.tv, has interviewed hundreds of people in the early stages of their working life and is in no doubt that people who start thinking about their career early have a significant advantage. ‘Once someone has an idea of what they want to do, they are able to work towards that goal. Even if they change direction later on, they will still have gained skills and experience. Motivation is a powerful tool and respected by employers.’ The Careers4u.tv website offers students inspiration and information via videos of young employees, entrepreneurs and apprentices. They volunteer their time because they remember how difficult it can be to find first-hand information and want to help the next generation. According to Dr Deirdre Hughes, OBE, Chair of the National Careers Council, ‘Young people with better career exploration skills are more positive about their post-16 and post-18 choices. Having access to good quality careers information and advice, especially around exam results time, is crucial. Tippitoes is delighted to announce the launch of its brand new 3-in-1travel system, Toto which is now available to purchase at www.tippitoes.com with an RRP of £385. Suitable for use from birth and designed to adapt to parent’s needs as baby grows, the Toto 3-in-1 is the first travel system from leading nursery brand Tippitoes. It has everything you need to ensure getting around with your baby is as hassle-free as possible. Incorporating pushchair, carrycot and car seat functions each option is designed with your baby’s comfort in mind. Available to buy individually the car sear, carrycot and pushchair are easily converted without the need for adapters. The carrycot and pushchair options are parent facing to encourage development through talking, laughing and interacting. The pushchair can also be used forward facing to allow baby to take in the world around them. The Toto car seat is a group 0+ baby seat suitable for babies from birth until they reach a maximum weight of 13kg/29lbs (approx 12-15 months). It features an impact absorbing shell with side impact protection to ensure your baby’s safety in the event of a side on collision. The lightweight car seat also features an adjustable five point safety harness, with chest pads and head hugger. 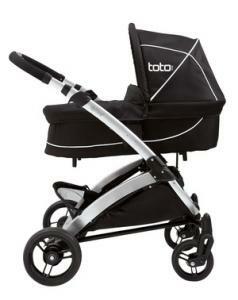 When not in use the complete travel system folds compactly for storage. The Toto travel system features front swivel pneumatic tyres complete with front and back suspension, linked rear brakes and an ergonomic sponge grip handle which ensure a secure and smooth journey for both baby and parent. Other added extras include adjustable hoods and spacious shopping basket. Available in a stylish black finish complemented by silver piping, the Toto 3-in-1 combines style, safety and quality at an affordable price. There are some things I think I do pretty well. There are others that need improvement and still others that are probably beyond anything I can help. I picked up golf for a while. How hard could it be, I wondered? I soon learned. It didn’t take long before I was consistently shooting in the lower seventies. Pretty much every hole. Two people actually gave up working with me to improve my game. Which is okay – I have more time now for doing things less frustrating, like solving the problem of world peace. What a marvelous parable for a life attitude. Stoop and drink. Especially when we have something to learn, when we want to drink from the fountain of knowledge, we may need to stoop and drink. He knew that he had much to learn if he were to play the violin well. And he was wise enough to know that he would learn better if could approach it with a sense of humility; he had to stoop in order to drink. Have you ever skied? Even if you’re an adult, if you’ve never attempted downhill skiing you would do well to begin by taking a lesson on the beginner’s slope. Yes, you may be the only person in the group over four feet tall, and you may also be the only one to slide down the slope backward while little people are whizzing by. Believe me, I know. But you’ll never get the hang of it unless you learn the fundamentals. If you stoop to take a lesson or two, you can leave the bunny slope behind forever. I think she’s right. I takes some stooping to approach something new like a beginner. But that is the way we learn best — at any age. Over the years I’ve come to realize that anybody can teach me, if I let them. Young people and old people, the uneducated and the learned — anyone can be a teacher. But not anyone can be a learner. It takes the right kind of attitude to learn. But if I’m able to stoop, I’ll have plenty to drink. [contentbox headline=”The Royal Pavillion” type=”info”]The Royal Pavilion is a former royal residence located in Brighton UK. It was built in three campaigns, beginning in 1787, as a seaside retreat for George, Prince of Wales, from 1811 Prince Regent. It is often referred to as the Brighton Pavilion. It is built in the Indo-Saracenic style prevalent in India for most of the 19th century, with the most extravagant chinoiserie interiors ever executed in the British Isles. The Prince of Wales, who later became King George IV, first visited Brighton in 1783, at the age of 21. The seaside town had become fashionable through the residence of George’s uncle, the Prince Henry, Duke of Cumberland, whose tastes for cuisine, gaming, the theatre and fast living the young prince shared, and with whom he lodged in Brighton at Grove House. In addition, his physician advised him that the seawater would be beneficial for his gout. In 1786, under a financial cloud that had been examined in Parliament for the extravagances incurred in building Carlton House, London, he rented a modest erstwhile farmhouse facing the Steine, a grassy area of Brighton used as a promenade by visitors. Being remote from the Royal Court in London, the Pavilion was also a discreet location for the Prince to enjoy liaisons with his long-time companion, Mrs Fitzherbert. The Prince had wished to marry her, and did so in secrecy, as her Roman Catholicism ruled out marriage under the Royal Marriages Act. In 1787 the designer of Carlton House, Henry Holland, was employed to enlarge the existing building, which became one wing of the Marine Pavilion, flanking a central rotunda, which contained only three main rooms, a breakfast room, dining room and library, fitted out in Holland’s French-influenced neoclassical style, with decorative paintings by Biagio Rebecca. In 1801-02 the Pavilion was enlarged with a new dining room and conservatory, to designs of Peter Frederick Robinson, in Holland’s office. The Prince also purchased land surrounding the property, on which a grand riding school and stables were built in an Indian style in 1803-08, to designs by William Porden that dwarfed the Marine Pavilion, in providing stabling for sixty horses. Between 1815 and 1822 the designer John Nash redesigned and greatly extended the Pavilion, and it is the work of Nash which can be seen today. The palace looks rather striking in the middle of Brighton, having a very Indian appearance on the outside. However, the fanciful interior design, primarily by Frederick Crace and the little-known decorative painter Robert Jones, is heavily influenced by both Chinese and Indian fashion (with Mughal and Islamic architectural elements). It is a prime example of the exoticism that was an alternative to more classicising mainstream taste in the Regency style. [contentbox headline=”Your headline” type=”info”]Brighton Marina is an artificial marina situated in Brighton, England. The construction of the marina itself took place between 1971 and 1979, although developments within it have continued ever since. The marina covers an area of approximately 127 acres (0.51 km2). It is owned and managed by Premier Marinas. The land within the marina has been developed in several stages and now accommodates a large Asda supermarket and two groups of boutique shops, restaurants and bars, plus a hotel, a bowling alley, a health club, a casino, and a multiplex cinema with a multi-storey car-park built over and around it. On the east side of the marina there are several gated communities consisting of townhouses and apartments, some of which come with their own moorings, alongside public moorings and facilities for boats and their users, ranging from boat sales and service companies through to a floating launderette at the main moorings. Both harbour arms are popular locations for local fishermen; the east breakwater is often packed to capacity during summer weekends, and there are regular sightseeing and fishing boat trips from the marina. A SeaJet service ran from the Marina to Dieppe in France between 1979 and 1980. Two Boeing Jetfoils were used, with three “flights” per day. The service suffered from poor reliability of the Jetfoils in the early stages, was restricted due to mid-channel wave height, and suffered during the French fishermen’s blockade of channel ports. In 1992 there was a trial of summer-season passenger services to Fécamp, France, using a small catamaran ferry. Immediately to the west of the marina is Black Rock, wasteground which was once a lido and is to be redeveloped into an arena. Yacht sailing, powerboating, and dinghy sailing training and charter is offered by a number of operators within Brighton Marina. Work was due to begin in spring 2007 on a new district of the marina to contain 853 new apartments, cafés, bars and restaurants. The development was planned for the south-western part of the marina and would partly sit on stilts over the sea. The centrepiece building was to be a skyscraper dubbed The Roaring Forties which would stand at 40 storeys tall and include a public viewing platform on the top floor. Two new pedestrian bridges were to be included in the scheme, one retractable to link the marina arms and the second to link the western beach with the new scheme. The developers are local firm Brunswick, and the architects are Wilkinson Eyre, noted for Gateshead Millennium Bridge. CABE have highlighted the development as one of four national developments demonstrating best practice in design and planning. No significant building work has started and the whole project has now been put on hold in view of the current financial climate. A planning application to redevelop much of the west side of the marina was submitted in October 2007. The plans include several tall apartment blocks (the tallest would be Marina Point which would be 28 storeys high and Quayside which was to be 16 storeys), various new retail provisions including small shops, a new central square (where the current roundabout stands) and an “eco park”, connected to the Undercliff Walk. The supermarket would be demolished and rebuilt to a larger size with car parking underground and apartments above, freeing up the considerable space presently used for its open-air car park, allowing for further development. The petrol station and McDonalds would also be demolished and rebuilt under this scheme. Around five new apartment blocks would be added to the marina in total. The developers are Explore Living, a division of Laing O’Rourke, and the architects are Allies and Morrison. Planning permission for this scheme was refused on 12 December 2008 when the six Conservative and three Green members of the planning committee voted against it, with only the three Labour members voting in favour. There has been considerable local opposition to both the above developments, which have been accused of being inappropriate, too dense, damaging to the Brighton skyline and to cliff and sea views, and in breach of the provision of the Brighton Marina Act 1968 that no building should exceed cliff height (approximately seven storeys). The main campaigning organisation is save brighton which is coordinating opposition from individual residents, residents’ organisations and amenity groups. 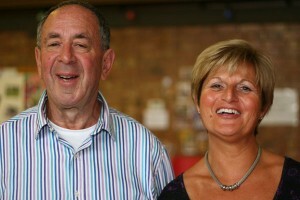 The campaign was launched in November 2007. The founder of save brighton, Brian Simpson, has called for the “gross over development of Brighton Marina” to be stopped. [contentbox headline=”Brighton Fishing Museum” type=”info”]Come take a journey with us into the rich history of Brighton’s Fishing Community. Discover a Brighton of the past: a bustling little fishing village on the south coast which was transformed into a fashionable seaside resort. Brighton Fishing Museum traces the unique story of the fishing community in Brighton, captured in a wealth of film, photography, paintings and memorabilia of Brighton seafront life. Let us guide you through the Brighthelmstone of the 1700s, when patients were first prescribed the seawater at Brighton for its medicinal benefits. You’ll discover how Brighton soon developed into a fashionable resort town, a retreat for the rich, following the patronage of the Prince Regent – all with mixed reception from Brighton’s fishing community at the time. By the mid 1800s, with the arrival of the railway, Brighton had become a haven for day-trippers. Discover how many of the fishermen began scrubbing down their punts each day after fishing and turn them into pleasure boats. Fishermen became boatmen, showmen of the sea and the water a funfair. With the arrival of the piers, you’ll see how Brighton became the town we know today. Brighton Fishing Museum offers a truly intriguing look at the history of this famous town and it’s community. You’ll find hundreds of pictures and artefacts and if that wasn’t enough, we’ve managed to squeeze in a 27 foot clinker built punt boat – the traditional Sussex fishing boat – as the museum’s centre piece. 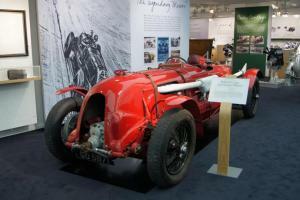 Go to the Brighton Museum Website for lots more info. Aston Martin is lifting the lid on an extreme new sports car with the global debut of the V12 Vantage Roadster. The new sports car, available as a limited edition in selected markets worldwide, immediately becomes the most potent example of the open-top Vantage range and mixes the breath-taking power of Aston Martin’s naturally aspirated 6.0-litre V12 engine with the established thrills of Vantage Roadster driving for what is an unforgettable sports car experience. The V12 Vantage Roadster’s 6.0-litre engine, mated as in the Coupe to a six-speed manual gearbox, generates 517 PS at 6,500 rpm and a muscular 570 Nm of torque at 5,750 rpm. It has been intelligently packaged into the Vantage Roadster’s compact form to fully exploit the sports-orientated model’s ample natural agility. The naturally-aspirated V12 provides high levels of power and torque yet it delivers a flexible, refined driving experience illuminated with the potential for truly electrifying performance. The 0-62 mph sprint is dispatched in just 4.5 seconds* while this most potent Aston Martin Roadster is capable of 190 mph*. While the Roadster naturally shares much of the technical and specification features of the V12 Vantage Coupe, some elements are redesigned to take account of the Roadster’s neat packaging and engaging dynamics. 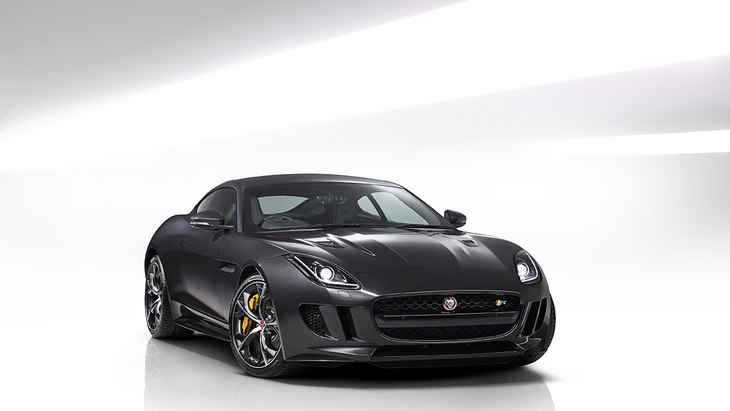 Sport mode, meanwhile, is designed for use in more dynamic driving situations where sharper responses are required. It has a number of tangible effects on the powertrain including a sharper throttle response, with the engine delivering more torque during the early stages of throttle pedal travel. Exhaust system bypass valves are also kept open for longer to create a particularly sporty exhaust note. Aston Martin Chief Executive Officer Dr Ulrich Bez said: “The V12 Vantage models are, first and foremost, driver’s cars – inviting and fully rewarding the driver’s full involvement. Available to order in selected markets now, the new Aston Martin V12 Vantage Roadster is priced at £150,000 RRP in the UK. Current world champion and Links of London Ambassador Keri-anne Payne will take to the water on Thursday as the favourite in the 10k open water event at the Serpentine, Hyde Park. In her final moments of preparation before she comes under the spotlight, Keri-anne takes the time to reflect on her journey to London 2012. Aside from the gruelling training and competition schedule that has honed Keri-anne’s talent in the open water event, the swimmer also acknowledges that the road to the Games couldn’t have happened without the support and inspiration from key figures in her life. The video sees Keri-anne reveal her biggest supporters and the contribution they have made to her journey, including her mum, fiancé and fellow swimmer David Carry and her swimming team. Felix Baumgartner completed the final milestone remaining before he attempts to achieve his dream of becoming the first person to break the speed of sound in freefall. According to preliminary data, his test jump from a 5.3 million cubic-foot / 150,079 cubic-meter balloon achieved an altitude of over 96,640 feet / 29,455 meters, seeing Baumgartner execute a 3 minute, 48 second freefall jump reaching speeds of 536 mph / 862 kmh. The test launch was twice delayed due to thunderstorms, wind and rain. But the team of aerospace experts was never discouraged, well aware that even Space Shuttle launches sometimes faced several days of postponement. 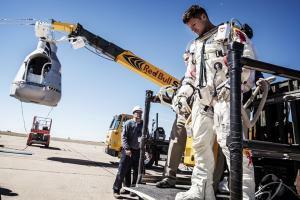 Baumgartner’s successful test is proof that patience pays off. The balloon for Baumgartner’s final ascent will rise as tall as a skyscraper – requiring surface winds of no more than 4 miles / 6.5 kilometers per hour to avoid endangering its delicate plastic envelope. The date for the record jump is now subject to favourable weather conditions and critical post-jump assessments on the capsule and equipment. Today’s successful test, with a balloon over four times as large as the one that carried the pilot at the first test flight in March, delivered new insights for the progress of the project and also new research data for the benefit of aerospace research. Pending official data review and confirmation, the leap from over 96,640 feet / 29,455 meters takes Baumgartner past Russia’s Yevgeny Andreyev (83,523 feet / 25,458 meters) to make him only the second man to have successfully completed a jump from such an altitude. His planned freefall from 120,000 feet / 36,576 meters would finally break the record of 102,800 feet set 52 years ago by the only man who has jumped from a higher altitude, Baumgartner’s mentor Joe Kittinger. (Crewe and Goodwood, 29 June 2012) Just 35 miles away from the fabled Brooklands race circuit where it astonished thousands of spectators eight decades ago by sprinting its way into the record books, Sir Henry ‘Tim’ Birkin’s dramatic 4 ½ Litre Supercharged ‘Blower’ single seat racing machine returned to record-breaking form by reaching a sale price of £4.5 million when auctioned by Bonhams at the Goodwood Festival of Speed today. This new world-best for Birkin’s striking 240bhp supercharged red racer now outstrips the previous record by a Bentley at auction when the Speed Six known as ‘Old No 2’ achieved £2.8 million at the Le Mans Classic in 2004. At its racing zenith and with the famously fearless and dashing ex-fighter pilot and Le Mans winner Birkin behind the wheel, this unique Bentley was one of the undoubted stars of the high-risk Outer Circuit at Brooklands. 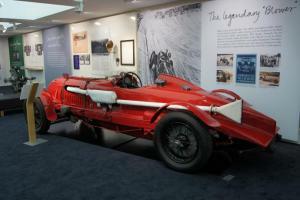 In March 1932 Birkin set a record 137.96mph (219.93kmh) at Brooklands, a feat even a man renowned for pushing back the limits in motor sport would describe as hair-raising: “there are bumps which jolt the driver up and down in his seat and make the car leave the road and travel through the air,” said Birkin.